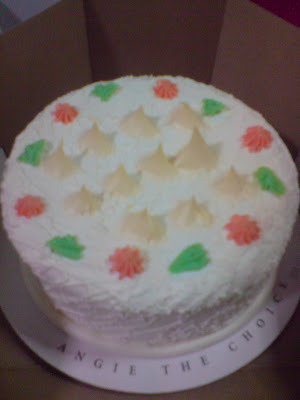 Cake brought by special friend from Angle The Choice. A last minutes call out from office to Tianjin on Christmas eve, which required me to fly on 26th Dec for three days. I had never been to China so I treat it as a short trip for myself although this is an business trip. Nothing much of leisure for myself, except to bookstores and one museum tour in the cold snowing day. And since Tianjin have only one vegetarian restaurant (that they can find it), we went there for every meal especially for my preference. Thanks to the local vendor. The weather was so hazey on my 1st day of arrival. Luckily it turned clear and I managed to return Singapore for my birthday celebration with special friend. We don't celebrate this festival but do enjoy the joys that was brought by Christmas. 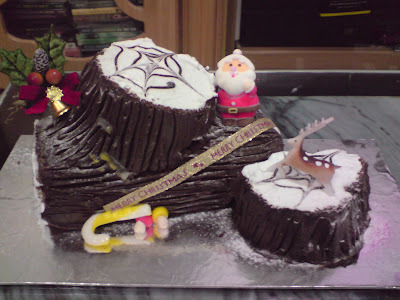 This log cake was given by special friend's sister, which specially 'order' to add less sugar and more rich chocolate. No wonder so yummy......... And we cut the cake at 12am sharp when our neighbour counting down to their MERRY CHRISTMAS in the party. Dogs are loyal, and indeed they are. 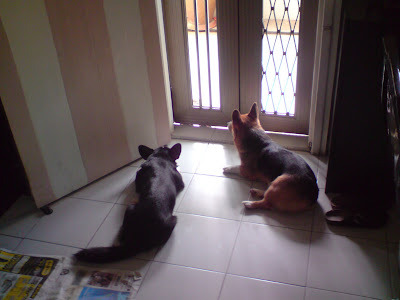 Just see what's our dogs (and my nephew's friend, who often bring his dog here too) are doing after their owners left the house. They wait for their return. Well, we can't conclude a birthday celebration without birthday cake and present, which we had already intended to pass to her on Sunday. So after class, we acted like normal case, went back individual. But actually me and another two guys went the other way to buy a small cake and surprise her at her own house with her present too. I believe she must be very touched too!!!! Complete package of her birthday celebration, hee hee hee............... I think only young people will have so much of ideas for friend's celebration. 4.30pm - Class released, we headed to Sentosa directly by Jess's vehicle. 5.00pm - Rain pouring during the journey but we managed to reach Siloso beach within half an hour. 5.01 - 6pm - Before I reach Underwater World, I was 'half-wet' cos the Tram was not fully covered and my pant was totally wet. No choice but continue heading to the FishReflexology to get foot massage. At the end, the lady told us it's fully booked. Oh no, what a day in Sentosa. So we went back to Siloso beach and this time, I went to buy a short and slippery to ease off my uncomfortable feeling by wearing the wet pant. 6plus - Went for our dinner at Amis restaurant. Trust me, if you are not keen to watch the show - Song of the Sea (cos we can't get the ticket at 7.40pm, all sold out) which can be seen from the 2nd storey of this restaurant, don't go for the meal. It's expensive and small portion and most disappoint was, not much choice from the menu. 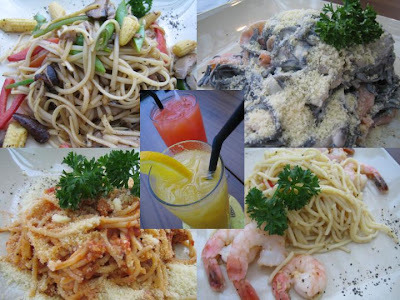 Only 4 different types of spaghetti and 2 desserts, 2 side orders. 8.10pm - All of us walked down to Palawan beach where the birthday girl's husband and another classmate were there, giving surprise to SK, by lighting out SK on the beach. Of cos we did clear up the mess after that. 10pm - Heading to Habour front for supper cos dinner was not enough for me, hee hee. 10.30pm - Most of the shops had closed but Sonny still managed to buy me vegetarian sandwiches at Vivo City, so sweet of him. Got this email from my friend. Anyone read this before and is this true???????? 非常重要！請告訴你身邊所有戴隱形眼鏡的朋友在烤肉，或任何有可能接觸到火源的地方，請將你的隱形眼鏡拿掉！聽過一件很可怕的事情發生在 Malacca,…有一天，一個 21 歲男生戴著隱形眼鏡去參加一個烤肉聚會 !就在他開始以木炭生火之後的幾分鐘內，他突然大叫，然後很痛苦的跳來跳去，在地上打滾 …全場的人都嚇呆了，沒人知道究竟發生了什麼事大家趕緊送他到醫院，醫生說，他永遠都看不見了！原因是：隱形眼鏡是用塑膠製成的，而就在他生火的同時，過熱的溫度熔化了他的隱形眼鏡！所以請告訴你身邊的朋友烤肉及接觸火源時，請不要戴著隱形眼鏡！！如果您收到別人分享給您的好文章，不要吝嗇，您也可以繼續分享給好友，請別忘我 這一份喔。當我們用心對人時 , 有心人將以熱情回報妳 , 希望我們都是用心的人 , 也是有心的人 . We had been hearing this word for so many months for so many items except our salary. 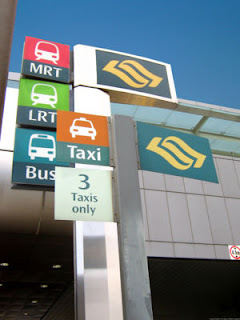 But when the fare for MRT and Buses increase which will be coming out soon, there is really nothing for us to do cause we need to take these transport daily. What to do? Face the fact and live with it, cos no matter how loud we going to scream out our thinking, no one is there to listen. All we can only do is to cut here and there, this and that in order to 'top up' the price for all increasing items. So next year onwards is going to be a tight budget year for myself. Went to special friend's sister house and saw the little cutie dog they just bought. Puppy dog is always so nice to carry and play with. Now my niece wants me to bring her back to our house to play with. After our 1st lesson for second semester, we had a wonderful birthday celebration for Kammy, the youngest girl in our group. 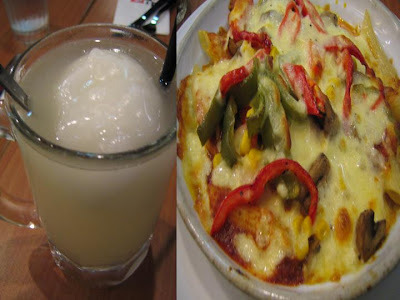 After 'gift presentation', we went dinner at N.Y.D.C, which I chose my favourite oven-baked pasta and lemon shiver. Then we had a little surprise for her by bringing her to the open space of the fountain, while Yves and I went to collect her birthday cake and to delicate Birthday song (Suntec fountain have song delication service). Then present the cake while she was still in the shock. After eating the nice chocolate Mini Goldmint, we went to Eski bar for a drink. Too bad the birthday celebration didnt end till mid-night cos we still have class on Sunday. Christmas is round the corner and I believe a lot of workplaces are organising Christmas lunch or dinner for little celebration, to enjoy the holiday season. My department is organising lunch on the 19th Dec (initially we wanted to be a dinner affair but some of my colleagues are not able to make it, so idea was given up) and I suggested the 'Secret Friend Gift Exchange' game to the organising committee, which I guess this is not so common here. I first experienced this game when I was 1st year in Brazil. Now come to think of the past, I do enjoyed that moment and I really miss my Brazilian colleagues. They are really so fun-loving and passionate. 1) Every participate will need to write down their wish list provided, with the budget given of course. 2) Drop individual wish list into a box and draw one list after everyone have given their list. 3) To buy the gift accordingly to the list. 4) On the day of the game, one person will start the ball rolling by introducing his/her secret friend, base on his/her expression, everyone presence will then guess who that person is. 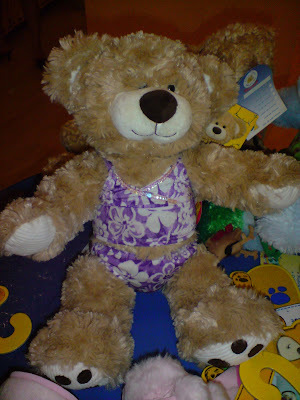 With the right guess, that person will present his/her gift to the secret friend. And this goes on till the last person got the gift. Funny thing is, some people still have negative thinking on this idea (I wonder why) and ask why can't we just have the normal gift exchange, mean to have a number on each gift and have the lucky draw for it. I dont quite like the idea cos it is so difficult to buy a gift without knowing who will 'pick up' your present. That's why chocolate and photo frame become so common during this season. The excitement does not dies off for the whole afternoon, so Sam and I decided to go to Vivo City and build-a-bear, and of cos I ask 'special friend' to tag along too. 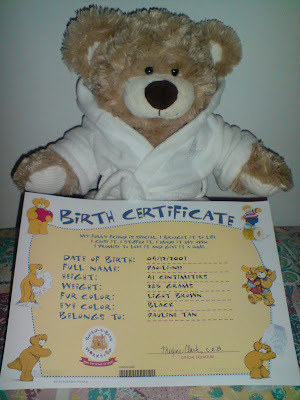 Call me 'Crazy girl' or 'Childish' if you wants to but I really enjoying the process of building my bear. Although the price is not cheap too but this might be a lifetime thing that I am going to get this forever friend home, I think its worthwhile. (Hmmm, hope it's one time thing, or perhaps to buy more clothings for her). 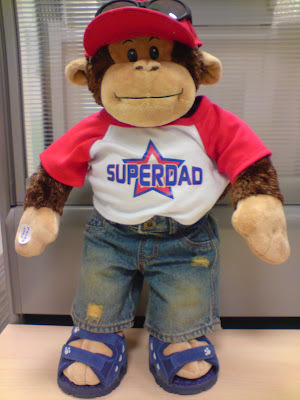 I thinks its more fun than the Barbie doll, hee hee. 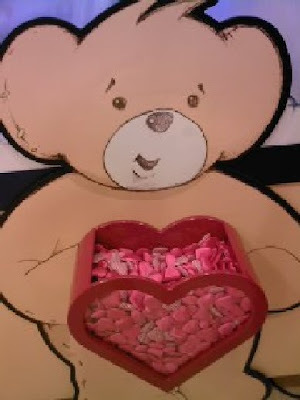 Processing................. Rub the heart with your hands, make a wish and rub it again, then put this 'alive heart' inside the bear. 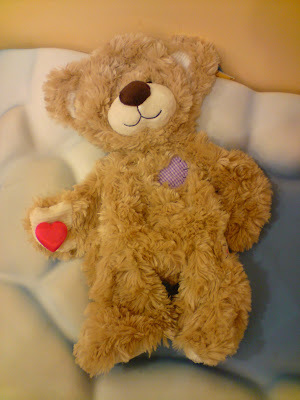 Home Sweet Home, I am going to hug her to sleep every nite. 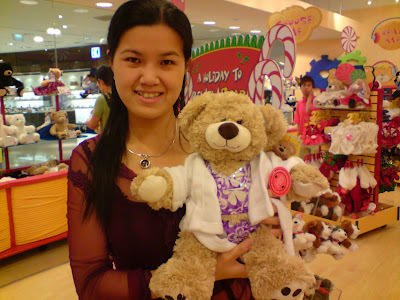 My elder sister first commended was "Aiyo, how old are you now to buy this bear." Who cares, as long as its can melt my heart, age is just a number after all. As usual, we have the little celebration every month in our office for the birthday babies. 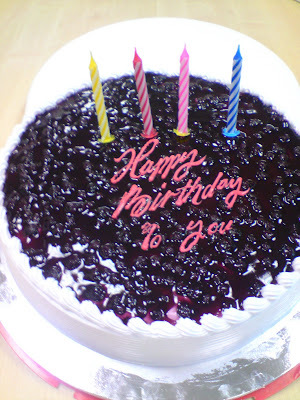 And Dec is my birthday month (although my birthday is not here yet), it's time for celebration. Thanks to my colleagues for all the arrangement every month. 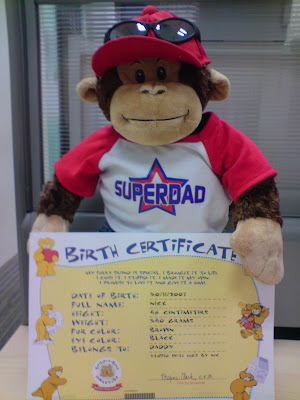 My colleague received his birthday present, "Superdad Bear" from his daughter. So cute. 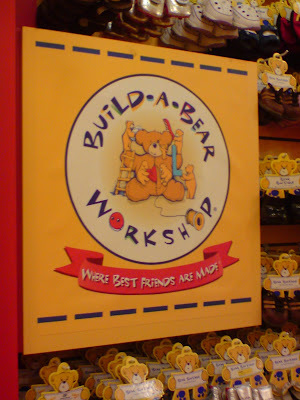 You can select the type of bear (with their birth cert) and their clothing, shoes and even accessories for your beloved from this shop. I like it a lot. I will visit the shop one day. Singapore is changing in every moments and I wonder how much I can follow the pace. What about you?